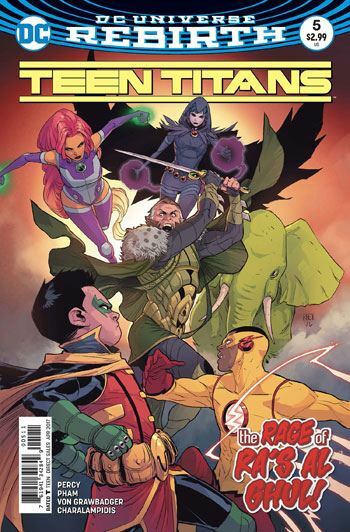 The first story arc for the new line up of the Teen Titans comes to a conclusion in issue 5. In some ways, it’s a bit formulaic. Did anyone really expect Robin to die and the team members to go their separate ways? I sure didn’t. But getting there is all the fun. Percy has a great time with Beast Boy’s dialogue, and even though not every joke he tells is a winner, his attitude keeps what is a fairly dark and heavy story clipping along enjoyably. 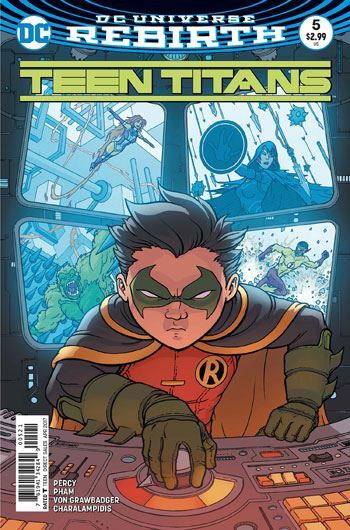 There is no shortage of action in this issue, with the Teen Titans coming together to fight off the former “classmates” of Robin, from his time with the League of Assassins. The battle does go somewhat differently than expected, which was an entertaining development. Mention is made in this story of the White Ghost, the son of Ra’s Al Ghul who sacrificed himself in the Resurrection of Ra’s Al Ghul storyline. Dusan Al Ghul was also the father of Mara, the cousin and arch enemy of Damian. I did get the sense from this issue that Dusan is being set up for a return. I’m kind of hoping that I am wrong, the White Ghost never appealed much to me as a character. Percy is doing a very good job with the different characters on the team. Kid Flash, Raven, Starfire and Beast Boy are not the focus of this storyline, but each one did get a degree of development in this arc. And Damian seems to be maturing a bit as well. Hopefully not too much. He does say please in this story, and astonishingly this does not kill him.